I promised last week that I would post how I cooked my country ham, and I figured that Tempt My Tummy Tuesday would be the perfect day to do it. I grew up in a very small country town, and worked at the grocery store in town. It's one of those cute little stores with a meat counter that serves plate lunches, and still has a butcher. I learned how to cook country ham by working here, and was taught by one of the best cooks around an 85 year old man who wouldn't even let cancer keep him at home in bed, he always made it to work. At Christmas time he would cook country hams for people, and would always have to stop taking orders to cook hams because we just simply had way too many orders. It was nothing for us to have eight to ten broilers going at the same time. 1. Put two to three inches of water in the bottom of your broiler. You want enough water to keep the ham moist but you do not want it touching the ham. I hope everyone had a wonderful Christmas. While I am sad that Christmas Day has already came and gone, I am also grateful for the rest that this next week will bring. After a three day Christmas celebration, on top of three days of preparation for the big event I am absolutely, positively beyond exhausted. I used my recipe for Sweet Dinner Rolls for the bread dough. However my bread was really thick, I think that I let it rise too much, which made it extremely hard to get the inside of the bread done without burning the crust of the bread. My bread was still pretty doughy inside. While we do have plans to stay home for the most part this week there is a chance we might be going out of town mid-week, nothing like a spontaneous road trip. So this week's menu is definetly subject to change. I know it's Wordless Wednesday but what good are pictures without at least a few words? We took the kids to Bass Pro Shop yesterday to see Santa and couldn't resist posing for a few pictures with their cute Christmas scenery. And on Sunday night I went to a Cookie Exchange with some friends. I made Russian Tea Cakes and Holiday Truffles to take. Here they are all wrapped up in tissue paper and ready to go. I have one of those cake stands that converts into a punch bowl. I filled the bottom of the bowl with some gold fabric left over from the apron I made for the White Christmas Apron Swap, a few strands of pearls, and some glittery Christmas ornaments. The pearls are from some necklaces that belonged to my youngest daughter, the necklaces broke but I kept the pieces anyhow. I have strung them on my tree the past few years but didn't this year. And here is a picture of the plate with cookies for the tasting table. I have already had one very sweet person ask what kind of cookies I am going to be baking so here is what I will be doing today. It is so hard to believe that Christmas is almost here! Which means this will be a very busy week for us, and unfortunately we will be eating out way more than I like to this week but as part of my effort to make Christmas less stressful for myself this year, it is something I am okay with. At least that is what I keep telling myself. Yesterday we were suppose to have the Dry Rub Chicken With Honey Barbecue Sauce but didn't get around to it. I went to a cookie exchange last night, and had a few errands to run before I left so I went through the Arby's drive thru to save on time. Since I already had the chicken laid out we will be having that for supper today instead. I participated in the White Christmas Apron Swap at Flirty Apron Swap last month, and while I had a blast putting the package together it did cost a little more than I expected. It wasn't a lot, and it was fun, but definetly not something I could afford to do on a regular basis. So I told myself that I wouldn't do another one for a little while. Well as soon as I said that I read a post on Hot Mama Apron Swap about their new apron swap and just couldn't resisit participating. There were several other goodies in the package, some candy (which didn't last long), some candleholders and a gold "Celebrate" sign from Michael's. The sign was definetly my favorite thing in the package (aside from the apron of course), and I think it looks great displayed atop my Nativity picture. Don't you? 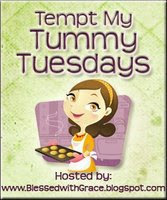 Can you believe that I have been menu planning for fifteen weeks now? Time sure does fly! I have to admit that I had no idea how big of a help menu planning would be until I started doing it. 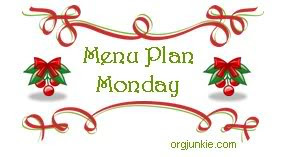 I have really come to depend on my menu plan, and the week that I did skip a menu plan I really missed it, I felt like a mess. Last week wasn't a huge week as far as cooking goes, the only new recipe that I tried was the Roast Beef and Gravy recipe from Taste of Home and it was absolutely delicious. My husband wasn't sure if he would like it based upon the smell of it cooking (it had a very strong wine smell) but he ended up loving it. It is definetly a recipe that I will add to my favorites list. I cooked two roasts using this recipe and froze the leftovers for a later date. We didn't get to eat our Tarragon Chicken last week so I am going to add it to the menu for this week. It is one of my favorite meals. Ingredients: 6 breakfast cut pork chops 1 cup all purpose flour 1 1/2 teaspoon sea salt 1 1/2 teaspoon freshly ground peppercorn 2 eggs 3 tablespoons canola oil (or other oil for frying) Directions: 1. Mix flour, sea salt and peeppercorn in a shallow bowl. 2. In a second shallow bowl beat the two eggs. 3. Dip each pork chop in the egg mixture, and then dredge in the flour mixture, coating thouroughly. 4. Heat oil in a skillet over medium high heat. 5. When oil is hot brown pork chops in the skillet. Cook for five minutes on each side or until the pork chops are golden brown. We like to serve these with white pepper gravy. We eat a lot of potatoes around here, and I am always looking for ways to spice them up. One of our favorite potato variations are these Cheesy Hot Potatoes.